A REALM OF SHADOWS is book #5 in the bestselling 5 book series KINGS & SORCERERS–which begins with RISE OF THE DRAGONS (Book #1 )–a FREE download! 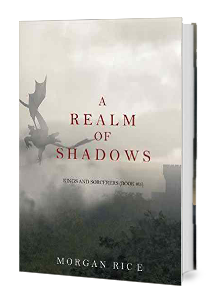 A REALM OF SHADOWS is book #5 in Morgan Rice’s bestselling epic fantasy series KINGS AND SORCERERS (which begins with RISE OF THE DRAGONS, a free download)! In A REALM OF SHADOWS, Kyra finds herself in the midst of a burning capital, attacked by a host of dragons, clinging for life. With her beloved homeland destroyed, The Flames down and the trolls pouring in, Kyra must urgently quest to Marda to retrieve the magic weapon before it is too late—even if it takes her into the very heart of darkness. Duncan finds himself trapped, with the others, in the burning capital, and he uses all his wits to find his men, attempt escape, and rally his forces to regroup and attack Pandesia. Across the kingdom, Merk sails with King Tarnis’ daughter through the Bay of Death as they abandon the Tower of Kos and sail for the warrior isle of Knossos. Pursued by Vesuvius and his army of trolls, crossing the world’s most treacherous waters, they know they have little chance to reach the isle, and even less chance of escape. Dierdre and Marco survive the tidal wave that destroyed Ur only to find their beloved city under water. With everyone they knew and loved lost and dead, they must pick up the pieces and journey to the one person they know who is left alive: Kyra. Alec, meanwhile sails back for Escalon with the people of The Lost Isles, holding the precious sword that might just change everything. But none expect to encounter a land destroyed, a land that is now teeming with dragons. With its strong atmosphere and complex characters, A REALM OF SHADOWS is a sweeping saga of knights and warriors, of kings and lords, of honor and valor, of magic, destiny, monsters and dragons. It is a story of love and broken hearts, of deception, ambition and betrayal. It is fantasy at its finest, inviting us into a world that will live with us forever, one that will appeal to all ages and genders. Book #6 in KINGS AND SORCERERS will be published soon.